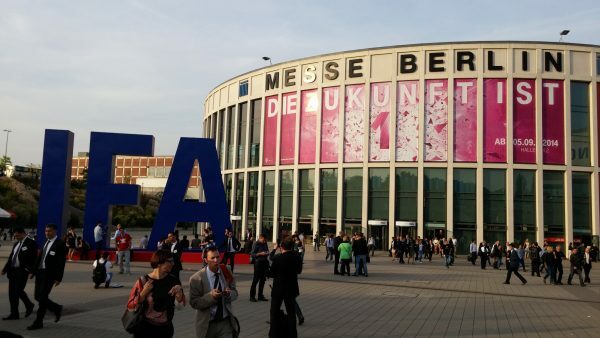 IFA is the greatest technology show that happens around the world. With almost 1500 exhibitors, there isn’t much in the consumer electronics world that is left. This is why top industry players like Samsung, LG, Lenovo, Sony and Intel like to use this as a ground to introduce different products to the world. I was lucky enough to be there, and while I only had the chance to visit it on day 1, and my trustworthy fitness scanner told me that I had walked over 9 miles. I didn’t even cover all the show, and to be quite honest, if there is a product you’ve heard of, there is a good chance it is on display there. The biggest and best thing to take from IFA is that it almost decides where the world of technology is heading for the next year. It has successfully done so since its introduction back in 1924. This year’s IFA was no different, and it highlighted the following to me as the trends for the next year, and perhaps the next few years. Fun fact, Mark Twain didn’t actually say it in those exact words. He probably didn’t have the words ‘personal computer’ as his middle name either. However, I am happy to report that the PC is definitely not dead. Talk to any company that makes computers and laptops, and they would happily tell you this over and over again. It is not a lie either. The stream of new and better products they are introducing shows their faith, as well as commitment to put both money and effort into this belief. PCs have evolved a few times over the years, and yeah, the tablets may have their fans, but thanks to the likes of Intel’s new Core M, the gap between the two is disappearing. Soon the PC may take a new form, but essentially it will still be a PC. In fact, I can happily report that the world of PCs has never been more exciting. You have 2-in-1s, you have detachable keyboards, and you have exciting new modules. They are getting lighter and thinner, and they are not just taking a form very similar to that of a tablet, they are actually giving you a PC’s performance in the same weight and thickness. Wearables have been around for a lot longer than we realise. Perhaps the first Casio Calculator watch, which made its way to the public in the 80s started the trend. The problem, however, has always been how you define a ‘wearable’. We have seen everything from smart watches, which are really just watches pretending to be phones to the likes of Google Glass and Oculus Rift VR Headset. A walk around IFA will show you that this is definitely the biggest trend in technology at the moment. In fact, I can say that there were probably more wearables at IFA than currywurst stalls in Berlin, and believe me, there are a LOT of currywurst stalls in Berlin. The main question is, how do you define a wearable? Most companies, including the likes of Polaroid, and of course the well known ones like Samsung and LG have taken the route of the smart watch. Then there are others who are trying to be different. Intel have teamed up with SMS Audio to produce a new category of smart headphones that detect your heartbeat. Oh, and we’ve always had those jackets that let you control your music through buttons on the sleeve. The exciting part is that these devices have jumped out of the concept phase to the affordable phase. Yeah, it will probably take us a little while to figure out what exactly a wearable should be like, but technical devices that we wear, which in my opinion is the true definition of a wearable device, are here to stay. It is like one of those futuristic films. You come home and the kettle starts to boil. The lights adjust to how you like them, and the heating kicks in to your exact preference. A little message on your watch or phone lets you know that the peppers in the fridge is about to expire, so it suggests you make fajitas tonight, and oh by the way, you do have all the other ingredients. Your favourite tracks come on, and as you fire up the hob, the recipe for fajitas appears on a screen on one of the devices. Your fridge, or maybe your kitchen clock. Once eaten, you go to bed, and as the smart light dims so you get the possible transition to sleep, your bed and pillow measure your quality of sleep, and help gently nudge you up with the smart light. All this is connected, so next morning you get an email letting you know that you did (or didn’t) sleep well, and perhaps eating so and so will help you get better sleep. You can also control your heating at home while you’re away, run your washing machine, and be aware of what in the fridge is about to go bad. Your vacuum cleaner is going to run a little earlier today, as you’ve got to get home early. It all sounds a bit utopian, but the connected home is here, and thanks to the likes of Intel and Samsung joining hands to form the Open Interconnect Consortium, the applications will only get better. There are of course the concerns of privacy, and they are fair. The advantages do surpass the disadvantages. More so, having standards means that companies and set ups will have to follow them, making the whole experience not only uniform, but also safer and more consumer focused. Of course these are just the three main highlights at IFA. A lot of other exciting stuff is on its way to the consumer, and we do live in exciting times!